In this article, we are going to see how to interface GSM Module to Arduino. There are different kinds of GSM modules available in market. We are using the most popular module based on Simcom SIM900 and Arduino Uno for this tutorial. Interfacing a GSM module to Arduino is pretty simple. You only need to make 3 connections between the gsm module and arduino. So lets get to business! A GSM Module is basically a GSM Modem Â (like SIM 900) connected to a PCB with different types of output taken from the board – say TTL Output (for Arduino, 8051 and other microcontrollers) and RS232 Output to interface directly with a PC (personal computer). The board will also have pins or provisions to attach mic and speaker, to take out +5V or other values of power and ground connections. These type of provisions vary with different modules. Lots of varieties of GSM modem and GSM Modules are available in the market to choose from. 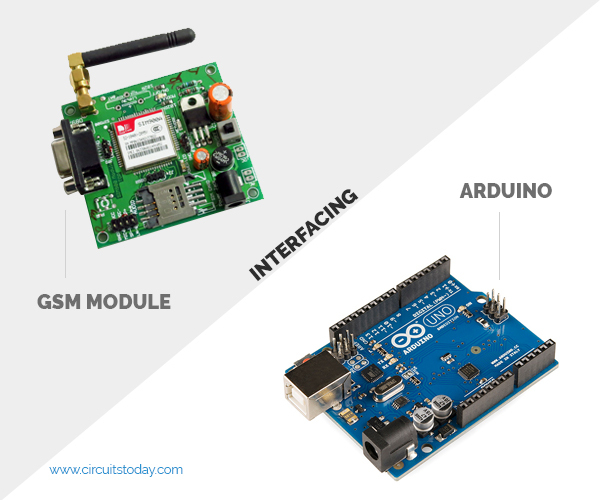 For our project of connecting a gsm modem or module to arduino and hence send and receive sms using arduino – its always good to choose an arduino compatible GSM Module – that is a GSM module with TTL Output provisions. GSM Module – Buyers Guide – are you looking to buy a GSM module? There are a handful of product variants for GSM module – like SIM900, SIM300, SIM800 etc. We have created this buyers guide to help you select the right GSM module for your project needs. 1. We use SIM900 GSM Module – This means the module supports communication in 900MHz band. We are from India and most of the mobile network providers in this country operate in the 900Mhz band. If you are from another country, you have to check the mobile network band in your area. A majority of United States mobile networks operate in 850Mhz band (the band is either 850Mhz or 1900Mhz). Canada operates primarily on 1900 Mhz band. Please read this wiki entry on GSM Frequency Bands around the World. 2. Check the power requirements of GSM module – GSM modules are manufactured by different companies. They all have different input power supply specs. You need to double check your GSM modules power requirements. In this tutorial, our gsm module requires a 12 volts input. So we feed it using a 12V,1A DC power supply. I have seen gsm modules which require 15 volts and some other types which needs only 5 volts input. They differ with manufacturers. If you are having a 5V module, you can power it directly from Arduino’s 5V out. Note:- GSM Modules are manufactured by connecting a particular GSM modem to a PCB and then giving provisions for RS232 outputs, TTL outputs, Mic and Speaker interfacing provisions etc. The most popular modem under use is SIM 900 gsm modem from manufacturer SIMCom. They also manufacture GSM Modems in bands 850, 300 and other frequency bands. 3. Check for TTL Output Pins in the module – You can feed the data from gsm module directly to Arduino only if the module is enabled with TTL output pins. Otherwise you have to convert the RS232 data to TTL using MAX232 IC and feed it to Arduino. Most of the gsm modules in market are equipped with TTL output pins. Just ensure you are buying the right one. So that’s all about the gsm module basics. Now lets power it up! 1. Insert the SIM card to GSM module and lock it. 2. Connect the adapter to GSM module and turn it ON! 4. Once the connection is established successfully, the status/network LED will blink continuously every 3 seconds. You may try making a call to the mobile number of the sim card inside GSM module. If you hear a ring back, the gsm module has successfully established network connection. Okay! Now let’s see how to connect a gsm module to Arduino! There are two ways of connecting GSM module to arduino. In any case, the communication between Arduino and GSM module is serial. So we are supposed to use serial pins of Arduino (Rx and Tx). So if you are going with this method, you may connect the Tx pin of GSM module to Rx pin of Arduino and Rx pin of GSM module to Tx pin of Arduino. You read it right ? GSM Tx –> Arduino Rx and GSM Rx –> Arduino Tx. Now connect the ground pin of arduino to ground pin of gsm module! So that’s all! You made 3 connections and the wiring is over! Now you can load different programs to communicate with gsm module and make it work. Note:- The problem with this connection is that, while programming Arduino uses serial ports to load program from the Arduino IDE. If these pins are used in wiring,Â the program will not be loaded successfully to Arduino. So you have to disconnect wiring in Rx and Tx each time you burn the program to arduino. Once the program is loaded successfully, you can reconnect these pins and have the system working! To avoid this difficulty, I am using an alternate method in which two digital pins of arduino are used for serial communication. We need to select two PWM enabled pins of arduino for this method. So I choose pins 9 and 10 (which are PWM enabled pins). This method is made possible with the SoftwareSerial Library of Ardunio. SoftwareSerial is a library of Arduino which enables serial data communication through other digital pins of Arduino. The library replicates hardware functions and handles the task of serial communication. I hope you understood so far! Â Lets get to the circuit diagram! 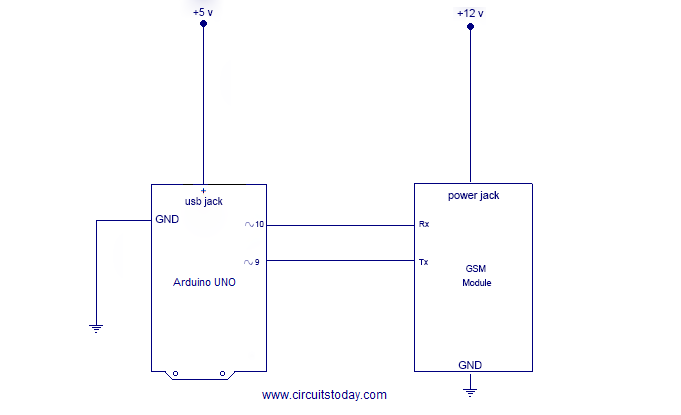 So given below is the circuit diagram to connect gsm module to arduino – and hence use the circuit to send sms and receive sms using arduino and gsm modem. 2) Receive SMS using Arduino and GSM Module – to the SIM card loaded in the GSM Module. so that’s the program/code to make arduino send sms and receive sms using gsm module! Let’s get to explanation of program! So in our code, pin number 9 will act as Rx of Arduino and 10 will act as Tx of Arduino.Â Lets get to the configuration part of program inside setup. The first task is to set baud rates of SoftwareSerial library to communicate with GSM module. We achieve this by invoking mySerial.begin function. Our second task is to set the baud rate of Arduino IDE’s Serial Monitor. We do this by invoking Serial.begin function. Both should be set at the same baud rate and we use 9600 bits/second here in our tutorial.Â Configuration part is over with setting baud rates and its good to give a small delay of 100 milli seconds. Now lets get to the actual program inside loop(). To make things simpler, I have developed a user input based program. The program seeks user input via serial monitor of Arduino. If the input is ‘s’ the program will invoke function to send an sms from GSM module. If the user input is ‘r’, the program will invoke the function to receive a live SMS from GSM module and display it on serial monitor of Arduino. The whole program is as simple as that! Serial.available() – checks for any data coming through serial port of arduino. The function returns the number of bytes available to read from serial buffer. If there is no data available, it returns a -1 (value less than zero). Serial.read() – Reads all the data available on serial buffer (or incoming serial data if put otherwise). Returns the first byte of incoming serial data. mySerial.available() – checks for any data coming from GSM module through the SoftwareSerial pins 9 and 10. Returns the number of bytes available to read from software serial port. Returns a -1 if no data is available to read. mySerial.read() – Reads the incoming data through software serial port. Serial.write() – Prints data to serial monitor of arduino. So the function Serial.write(mySerial.read()) – prints the data collected from software serial port to serial monitor of arduino. These are the functions in which we actually send commands to GSM module from Arduino. These commands to communicate with GSM module are called AT Commands. There are different commands to perform different tasks using the GSM module. You can read complete AT Commands Library to understand all that is possible with GSM module. SendMessage() – is the function we created in our arduino sketch to send an SMS. To send an SMS, we should set our GSM module to Text mode first. This is achieved by sending an AT Command “AT+CMGF=1″Â We send this command by writing this to SoftwareSerial port. To achieve this we use the mySerial.println() function. mySerial.println writes data to software serial port (the Tx pin of our Software Serial – that is pin 10) and this will be captured by GSM module (through its Rx pin). After setting the GSM module to Text mode, we should the the mobile number to which we shall send the SMS. This is achieved with AT command “AT+CMGS=\”+91xxxxxxxxxx\”\r” – where you may replace all x with the mobile number. In next step, we should send the actual content of SMS. The end of SMS content is identified with CTRL+Z symbol. The ASCII value of this CTRL+Z is 26. So we send a char(26) to GSM module using the line mySerial.println((char)26); Each and every AT command may be followed by 1 second delay. We must give some time for GSM module to respond properly. Once these commands are send to GSM module, you shall receive an SMS in the set mobile number. RecieveMessage() – is the function to receive an SMS (a live SMS). The AT command to receive a live SMS is “AT+CNMI=2,2,0,0,0” – we just need to send this command to GSM module and apply a 1 second delay. Once you send this command, try sending an SMS to the SIM card number put inside GSM module. You will see the SMS you had sent displayed on your Arduino serial monitor. Okay! That’s all and you are done. And you have learnt how to use arduino to send sms and receive sms message with example code. Read the AT commands library and start playing with your GSM module and Arduino! If you have any doubts please ask in comments. So that’s all about interfacing GSM module to Arduino. If you’ve any doubts, feel free to comment. I have this requirement. I need to collect data from RS232 of a certain equipment and has to be sent to mobile. If i send some command to the GSM module it has to read data from RS232 and send me back the data. Is it possible ?if so can you just give a hint of how to proceed. Interfacing of RS232 and GSM module to be done as well for that. Hi, pls i’ve been working on a sim800 project and been having some issues, would be glad if you could help out. The sim module sends sms normally using the example code, but for my project, it is meant to send a message to a number when the heart rate sensor detects an abnormality in the heart beat. the serial monitor shows the reading but when it is meant to send the message, it shows error CMGF. Pls i need help urgently. Hi sir good day. I would like to ask for help. I was able to send text messages using the above code. But my arduino uno module resets after the mySerial.println((char)26); line, prompting other codes after that line not executed. Please kindly help assess and advise.Thanks in advance. Hi sir good day. I would like to ask for help. I was able to send text messages using the above code but my Arduino Uno module resets after executing the line mySerial.println((char)26); prompting the code to reset as well. The following codes after that line resulted to not being executed. Please kindly help assess. Thank you in advance. hello sir i am trying to make 360 servo motor to run continously using GSM module can you help me for that program? but i want display only “hello world” and skip other content then what should i do ? what code should i use??? if i live in Cambodia, me should use how many gsm frequency rang ? I want to send this message to multiple recipients … can you help me in the code? if the same message has to be sent for every 10 minutes what has to be done? will the same work for SIM800A? hello sir i want help for a program the led will turn on when the recieved message is ON,then led will turn off when the recieved message is OFF, please help me for this program. Can you send me email of takudzwa muswaka who had same doubt as mine. I want to contact with him for this problem. He contacted you at 16 Feb 2016.
am trying to make a system that responds to any user who sends an sms command to the sim900 module using the exact step that you had provided ,but using mySerial.println(â€œAT+CMGS=\â€+91xxxxxxxxxx\â€\râ€); will only allow the system to send a response to one number , how can i implement a system that responds to multiple phone numbers wich send a command to the sim900 or a function that Retrieves the phone number an from an incoming SMS message and stores it in a named array , just like the function â€œremoteNumber()â€ wich is present in the aduino â€œGSM.hâ€ library . The article is very useful with all details about connections and software. I’m doing a project using arduino,gsm and gps.i have programmed the arduino. But i’m confused how to include lacation information(lattitude & longitude) information in my sms along with AT command.Can you help me out please..
Sir,your way of teaching is very nice. I tried to call to the SIM inside GSM module ,I got ring back.so,its working perfectly but when I compiled, got an error (stray/242).so, could you please recorrect the code and send. I am not able to receive sms on GSM module, although I am able to send a message. When I tried on Putty, I was able to receive message from GSM modem. Here is the code which I used. In your code where is gsm hearder file? I do have a question, hope you answer me. I am confused with the Arduino. Why do we need that if we can manipulate the GSM module (SIM 900) directly connected to the computer using AT commands? First of all a thank you for your brilliant description. Then to my problem. I am sitting in Sweden (not the problem…) but the sim cards here are. I’ve used simcards from Telenor on several modules also the sim900 but I cannot get any connection to the GSM net??? I am sitting close to the center in Stockholm, so connection should not be an issue, besides it worked on the A6 module. The funny part is that it sometimes work on the A6, sometimes not. On the sim900 it never worked so far. This issue is driving me mad. Any suggestions. In advance thank you. sir the program given is working perfectly. Thank u for all the above information,it all worked well for me.But now i wand my GSM to send a replay back whenever a particular message is being encountered. for example;Whenever i send “hello” to my GSM it should automatically replay back with “Hi”. Plz help me out to slove this problem. I. have uploaded the cod3? What will I do next? Hi there. I’m using arduino uno with sim900, followed each step you mentioned, but still no results displayed. I’ve entered the serial monitor, enter s or r for messaging but nothing showed up. I can use smartphone to call the sim card in the gsm shield though. Not sure what happened. I’m new to these stuffs. the message is showing in the serial port but a blank message received in the given mobile no. Hi. I need to send sms for multiple users using the same program…? @ sanjeevi – Save mobile numbers of users into an array. Execute the AT Commands to send SMS in a loop and call mobile numbers from array via loop iteration. si la temperature est superieur Ã 12Â°C uue sonnette d’un buzzer sera Ã©tablie, si elle supÃ©rieur de 15Â°C une alarme via SMS sera transmis via rÃ©seau GSM. I want need help for doing program to getting only text contain from my sms . for that i have choose algorithm which is only taking a part of text contain which is in between of * and # symbol.for that i am create this code but its not getting any result. I am using GSM 300 module and interface done with ARDUINO UNO. Serial.begin(9600); // the Serial port of Arduino baud rate. void Cmd_Read_Act(void) //Function reads the SMS sent to SIM900 shield. but what the output should be displayed when the module is supposed to receive call because my serial monitor is showing ERROR for receive call command. Is it possible to connect the GSM to 3,2 and load the program to the arduino? how can i send and receive message as string? I am making the same project but I found some trouble, my serial shows “Ã¿Ã¿Ã¿Ã¿” if I type “hi” on my serial monitor and also it’s not sending the message to provided number. New to Arduino but in the field or mobile repairs, will just be asking you everything. I need a Uno or Uno R3? I don’t want sms notifications. I want calling feature. And also tell me the code to stop the alarm. Hi, how to make the sending of msg to be automatic instead of the need to click ‘s’ and enter? Hi, i tried the code with SIM5320E, its not working. pls help. the mobile number is the sim card’s number on the shield or the number we want to sent the message to? how can i tried it out with the serial monitor? Hey i have used arduino uno for object detection sensor. i want to receive the messege whenever there is object in front of sensor. How to put code to receive msg from gsm module which is to be interface with arduino uno. help me to put gsm code in my program. my code for sensor is as follows .. I need to store the value sent through gsm to a variable in the arduino. What should be my coding. hello sir, im trying to use GSM sim900A in malaysia with using the exact step that you had provide. but the GSM still does not sending any text or receive text. but when im trying to establish the network connection of GSM, i had heard the ringing. so what is the problem ? can you help sir ? its important to me. thank you???? I was trying to turn on/off led’s by sending a message to gsm modoule (sim900A+arduino uno). But i get stuck at the point when the gsm receives the message. It receives the first message and displays on the serial monitor but after that it doesn’t shows other msg that are being received. 1). Sometimes it doesn’t shows messages next to first msg. 2). Sometimes the list of the messages suddenly appears at the same time in spite of being sent at different times. 3). Sometimes the msg gets displayed after 5-8min of entering the command to display received msgs. And some of these msgs have no data to display. I want a button(keypad) connected with Aurdino to send AT commands. Please help how to do this? Can you please help us to make our gsm works well? We have a problem in sending and receiving sms. We have a lot of codes but none of them were working. Can you help us send codes about the said problems/? Thankyou! I have tried several public domain arduino sketches with a SIM900 shield. The led on the shield flashes slowly showing connection established. However, I cannot send AT commands to it from my computer, and not able to send any sms messagrs to my cellphone. It worked a few months ago, but now nothing. Puzzeled about where to look. Any help would be appreciated. Thanks. Can someone help me? This is my code. I'm using arduino uno, sim900 module, mq2 gas sensor and buzzer to create a gas sensor detector based on sms. 1. The mq2 gas sensor detects and send the result via sms to the number set in the code. 2. We can send a specific string to know the surrounding gas percentage and send the result to the specific number set in the code. But I want to change the second option to be auto reply to any incoming number. What should I do? received signal from the GSM is how to read in ardiuno? Hello. Your code works perfectly, although I have a question. When I receive the text message, it is displayed on the serial monitor as it should. Is there any way to save that message and do with I as I wish? For example, if a text says “STOP”, I want to turn an LED off (using a relay). Thanks in advance. only the sending sms part works well but with the receiving part it doesn’t. my serial port doesnt show anything in it, its a plain blank space. Thanks for the tutorial and program. I have implemented your code but while running the program with my arduino UNO and GSM module SIM900A, no message is received in the provided mobile number. The serial monitor shows error in sending the message. Kindly suggest the possible cause for this error. I have also implemented the above code with arduino uno & Sim 800c. Receiving part works well. But in sending part, I have received error message and the message didn’t come to my mobile. can u find the solution of above problem? my serial monitors notifies me when a msg is received but doesnt show what the msg is? Thanks a lot for this useful project, sir, can I use SIM800l for this project instead of Sim900? Dear sir, thanks for this beautiful program, please can I use sim800l for this purpose instead of Sim900? And I tried with different codes and SIM 900A also working good sir(If I make a call I am hearing ringing sound),what is the problem I don’t sir. sir,I connected all the connections what you told that and code also same but I got 10 times message and didn’t get received message on serial monitor.Now I am not getting send and received message.I am using SIM 900A,Arduino AT Mega 2560.Please help me sir. I am doing project “WIRELESS WEATHER MONITORING SYSTEM”using arduino uno, GSM sim900a, LCD 16×2, temperature and humidity sensor dht11â€¦now I request yourgood self to please provide me a program that will display current temperature and humidity on LCD. also if we send SMS from any mobile number to a mobile number of simcard that is in GSM to send current temperature or humidity it must send back SMS to the mobile number from which it received SMS with current temperature or humidity..
sir i want to interface rain sensor with gsm module ie it shoul detect rainfall and send sms could please help me out? hi my sim has a pin number , how do i add that in the program. i am not able to receive sms. i cannot figure out the problem. to select ‘s’ or ‘r’ this should be send through serial monitor? Please help me how to send SMS to Mobile Number Stored in Variable. I follow the steps you described. But when I try to plug the shield onto my UNO, nothing works..
As I said, even with this shield, your tutorial does the job. I suppose I have to change the pins ? Is it possible to program the code in such a way that gsm module could be used to send sms to a preset number as well as manually entered numbers simultaneously using arduino? I have implemented the code but while running the program with my arduino UNO and GSM module SIM900A, no message is received in the provided mobile number. The serial monitor shows error in sending the message. Kindly suggest the possible cause for this error. I want to read the mobile number from an SMS sent to the GSM Module and then send msg from GSM module to the mobile number received. Can you please help me out with this? Please try adding country code. Also the delay seems to be very high. Just a 1 second or 2 second delay is enough. Use mySerial instead of Serial ! i don’t know for sure but you need an interface to connect your gsm to arduino. “Serial”gives connection just to monitor not GSM,Use”SoftwareSerial” to interface both.May be this helps..
a remote phone number that you enter through the serial monitor. is set to send a just newline when you press return. This example is in the public domain. do not print semicolon (;) after no..
hai, your code is working perfectly with my arduino mega. but I need to send GPS coordinates via SMS. how can I do that cos softwareserial can’t be used two times at a time. Can you advise on this?? when I use hardware serial for GPS delay was not taken. if u r trying to communicate the modules one at a time, u can use 4066 switch. check if it is suitable for ur project. Sir,im doing a project including arduino and gsm.i need the code for entering the phone number manually using keypad and send sms to it.will you please help me….. When i upload and try to run the program… nothing display on my serial monitor why is that? I already tested your code. it works perfectly. But, i want to modify to turn on/off the LED and not success. Could you help me, for this problem? Just simple, i want turn on LED 13, after recieve sms “on”. I already know how to control on/off the LED in arduino. The problem is, if i want to turn on the LED by send sms “ON_LED” and then send sms “OFF_LED” to turn off the LED. This my code, still not working for turn on/off the LED. inchar will read each character one by one serially. You cannot just compare inchar with a string. Do Serial.read everytime for all the letters in your input (ON_LED). Like do Serial.read, compare inchar with ‘O’, then Serial.read, compare with ‘N’, Serial..read etc…. Have you managed to get your program working. please can any one help me with program code without switch case i want to impliment the circuit with a battery supply. The same logic and methods can be used to develop your application idea. I am developing a project in which I also use an ultrasonic sensor and a shield gsm in order to send a message with the information about the measurements done by the sensor. I realized that you sent a message asking for help about this topic some months ago and I wonder if you have already got the code and if you could share it because I’m a bit blocked. My gsm module responds to first received message but not for the second one. what exactly is the problem ? Note:- You need to alter this program to receive messages continuously. we are doing project on smart sensor for agricultural field using GSM with AURDINO interfacing . according to different conditions of motor turn on and off for this how i have to write code for sending and receiving different messages. plz …..reply soon ….as soon as possible…. Please can you help me on this?? 1. You should connect it to TTL pins Rx, Tx and Ground. GSM Rx to Arduino Tx and GSM Tx to Arduino Rx. GSM Gnd to Arduino Gnd. 2. Dont worry about other jumper pins. Just make the connection. 3. After inserting SIM Card, Press and Hold Power button. Notice the Network Status LED marked as NET_STA on your GSM board. This LED should blink in 3 seconds delay continuously. 4. Make a call to the sim card number inside GSM module. If you hear ringing sound on your phone,the interfacing of GSM module to Arduino is perfect. I have followed your way already and I was able to hear ring back tone. But when try the code, Serial.available was not read in serial monitor. I don’t know what is wrong. Can you guess what will be the reason for this? but my Arduino serial ports are working properly. Thank you for your information. i have tried but there is no response yet. could you please tell me that do i need to edit coding rather than change the pin (in mega2560 PWM pins can be 4-12) and the destination mobile number?? Not all pins on the Mega and Mega 2560 support change interrupts, so only the following can be used for RX: 10, 11, 12, 13, 14, 15, 50, 51, 52, 53, A8 (62), A9 (63), A10 (64), A11 (65), A12 (66), A13 (67), A14 (68), A15 (69). 1.Make sure pins are configured in software correctly. 3. Make sure your country code is given correctly in mobile number. +91 – is country code of India. Change it to your country. Hi Sir, there is improvement in sending a SMS. I have used 50,51 pins and my no is given correctly. How can I use Mega Rx,Tx directly to interface SIM900A with Arduino?? Could you please explain?? Hi Sir, there is no improvement in sending a SMS. I have used 50,51 pins and my no is given correctly. How can I use Mega Rx,Tx directly to interface SIM900A with Arduino?? Could you please explain?? your code works perfectly. really really thanks for guiding me. there is one more change that i wanted to do to get successful. finally works with pin 11 and 12. Kindly explain how to send this ‘s’ and ‘r’ variables as input in order to call receive or send message function. @nismi – Open the “Serial Monitor”of Arduino. Type s and hit enter. Once you are finished with sending message, type r and press enter button. Are all GSM Modules the same? @suraj – What is the problem you are facing ? Serial commands are written in the program. To send ‘s’ and ‘r’ commands serially, open the serial monitor of Arduino. In my project I am out off all digital pin except Rx and Tx. Can I use the software serial library for Rx and Tx. Like instead of mentioning Softwareserial myserial (9,10) , can I mention Softwareserial myserial (Rx,Tx)? If not can you send the code for Rx,Tx. @chandra mouli – Check if your GSM module has TTL output provision. Most of the GSM modules available in market has TTL output provisions. If the module has only RS232 output provision, you need to use an RS232 to TTL converter to interface that particular module with Arduino. the message not send automatically…..
@Karthikeyan – We have tested this code many times repeatedly and it was working 100% all the time. Your issue may not be with the code. Double check hardware connections! Also check if you have input the mobile number correctly! Please can you explain how can we send the input reading through GSM modem. For example i want ardinuo to take input reading and then send it through sms. How can we implement this please? @Abdul Malik – Its actually simple. You first learn AT Commands to receive an SMS. Once you receive the SMS, save its content to a variable or array. Scan the array to check for required number/digit/character. How can i save the data to array or variable, can you give me the code. what does +32 mean? and where is it from? @wooja – I don’t have a good idea of the +32. It could be some number of characters sent or something like that. Refer AT Commands Datasheet. I did not understand your question. Please explain it again. am trying to make a system that responds to any user who sends an sms command to the sim900 module using the exact step that you had provided ,but using mySerial.println(“AT+CMGS=\”+91xxxxxxxxxx\”\r”); will only allow the system to send a response to one number , how can i implement a system that responds to multiple phone numbers wich send a command to the sim900 or a function that Retrieves the phone number an from an incoming SMS message and stores it in a named array , just like the function “remoteNumber()” wich is present in the aduino “GSM.h” library . I think your idea can be implemented with help of arduino GSM library. I am in the middle of another project, so can’t work on your idea now. Will definitely check this later. @aiman – It can be an error with your program. Double check the program. thanks, it is working fine!! We are using ” \” in â€œAT+CMGS=\â€+91xxxxxxxxxx\â€\râ€ to differentiate mobile no & AT command Stringset. I want to know how arduino reads this code? Yea thanks for this. I found out that output of the gsm module is static, i mean is only what we have input is what is doing. Is there no way it could check for out box messages and be able to re-send any in it to the controller. Maybe some other dynamic functions too. @Victor Its possible to read inbox and many other functions using GSM module. Learn AT Commands thoroughly for that. Thank you very much. The information about software serial was very helpful. Hi.. Frnds..can anyone say, the Tx, Rx terminals of arduino should connected to which port in GSM Module either Serial port or Rs485..?